Our Sawgrass Mills location will feature the next generation of escape game design and provide the platform for America’s Escape Game to continue to lead the escape game genre into the future. America’s Escape Game proudly announces the opening of our second company store in the Sawgrass Mills shopping district in Sunrise FL. This brand new location boasts 6 escape rooms and a large meeting facility, all located steps away from the Sawgrass Mills Mall; the most successful shopping destination in the state of Florida. 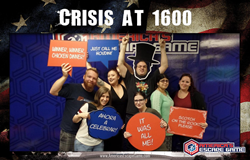 The first room to open in Sawgrass Mills is Crisis at 1600, the most popular escape room at America’s Escape Game on International Drive in Orlando, where guests are challenged to infiltrate the Oval Office, locate the control panel and stop a deadly missile attack. Crisis at 1600 will be closely followed by The Caretaker, Asylum, Encounter, Proving Ground and Atlantis Lives; all tremendously interactive and challenging escape games that take the escape room concept to a new level. Escape games are an incredibly popular form of entertainment and education. Escape are extremely fun, with exciting surprises at every turn. A group of 2-12 are locked in a themed room and you must work together and use your mental, physical and personal abilities to solve puzzles, decode clues and figure out how to escape within a 60-minute time period. Escape have become a national phenomenon due the broad range of appeal they have for all walks of life in America. Escape games are both a cerebral work out and social experience for all ages, and have become a popular family and team building activity. America’s Escape Game is proud to have hosted corporate team building events with some of the world’s most prestigious companies including Disney, Lockheed Martin, FedEx, International Paper, Enterprise Rent-a-Car, PepsiCo, Universal Studios, and many more. America’s Escape Game was founded in April of 2015, and is located in the heart of International Drive in Orlando Florida. America’s Escape Game has served more than 100,000 customers since its doors opened and is the worldwide leader in high quality immersive escape games. America’s Escape Game also owns and operates AEG Studios which offers turn-key escape rooms, escape room development, licensing, technology integrations and more.